Sadly, the time has come to say farewell to 2018's Sale-A-Bration. My favorite free product this year has been the Celebrate You Thinlits. 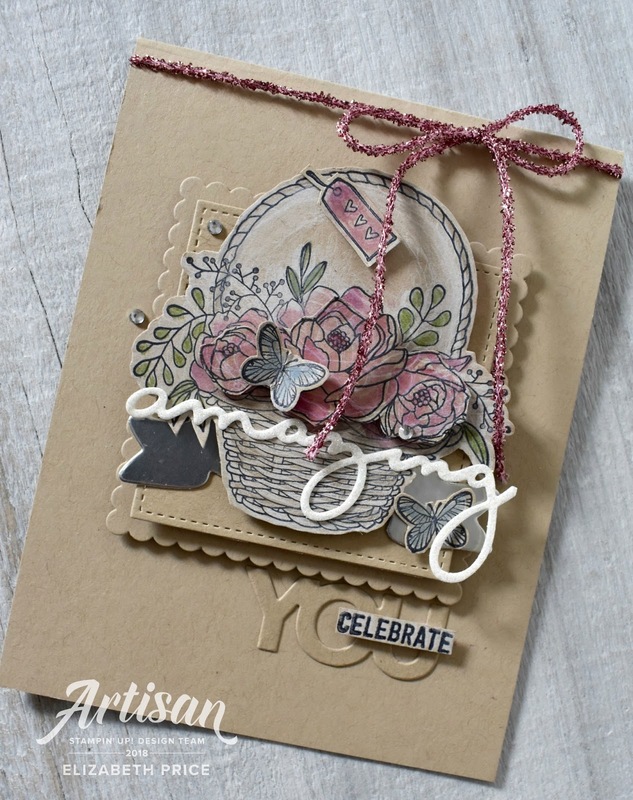 Hands down this is THE best freebie and I have to say a big thank you to Stampin' Up! for the awesome gift! 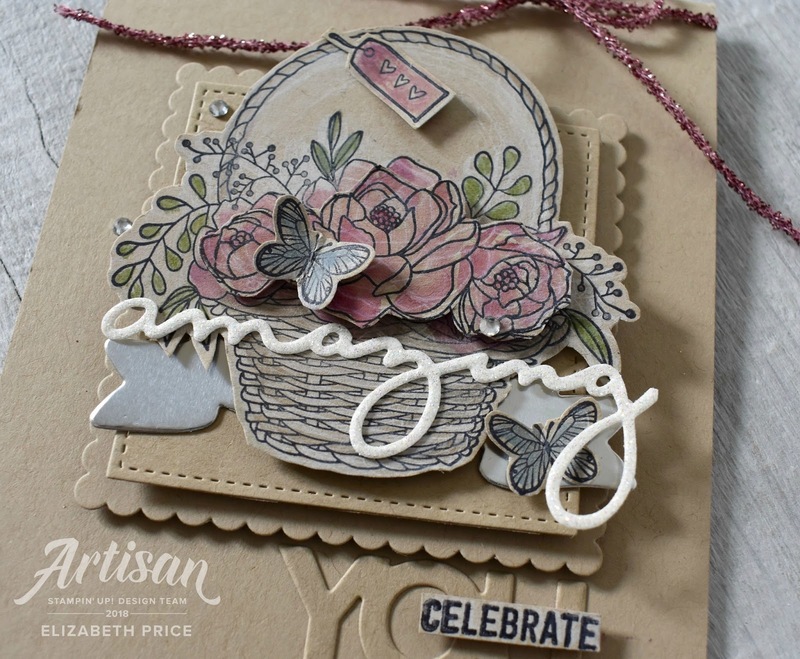 For this card I stamped the main image from the Blooming Basket set and then layered it on top of a bunch of die cuts. First layer is the banner from Bunch of Banners, next layer is from the Stitched Shapes, and the last layer is from the Layering Squares Framelits. I busted out the Sunshine and Rainbows Stamp Set along with the matching Rainbow Builders Framelits to make a fancy, shiny, glittery, rainbow card. That's right this card is shiny. Why? I cracked open a pack of Glossy White Cardstock. Yep, I stampin' old school and loving the look of the shine from Glossy paper. 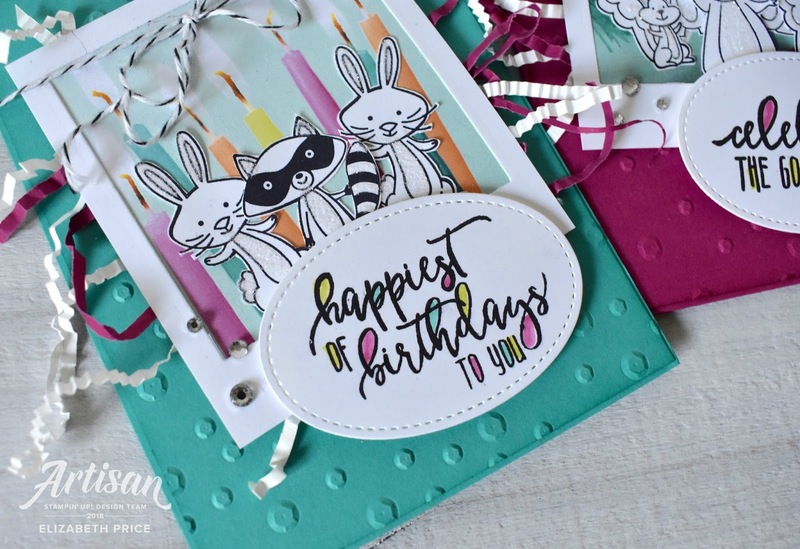 The top half of the card base, which is also glossy, was spritzed with light misting of Dapper Denim Ink Refill and rubbing alcohol. 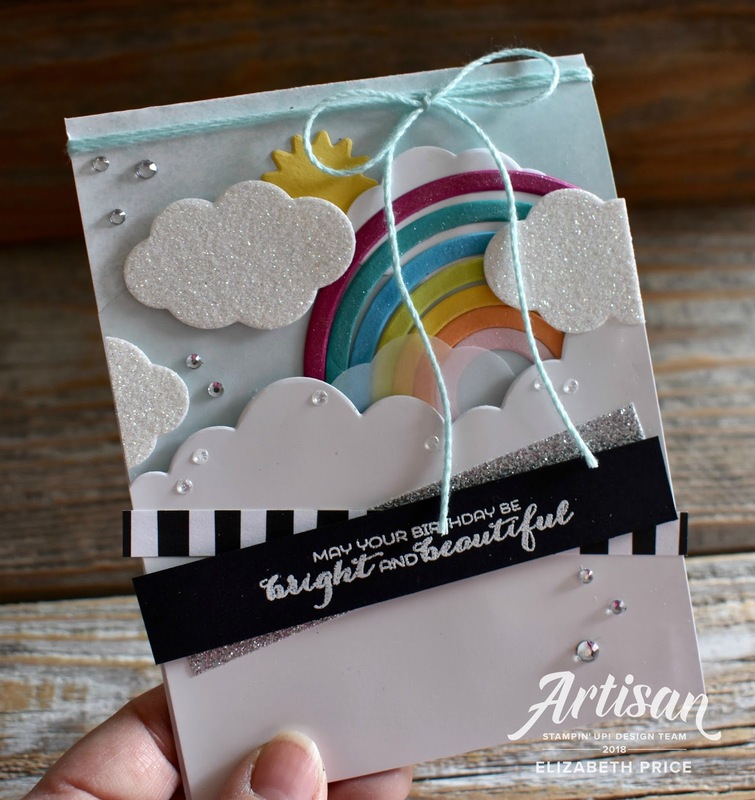 This card is loaded with lots of glitter. 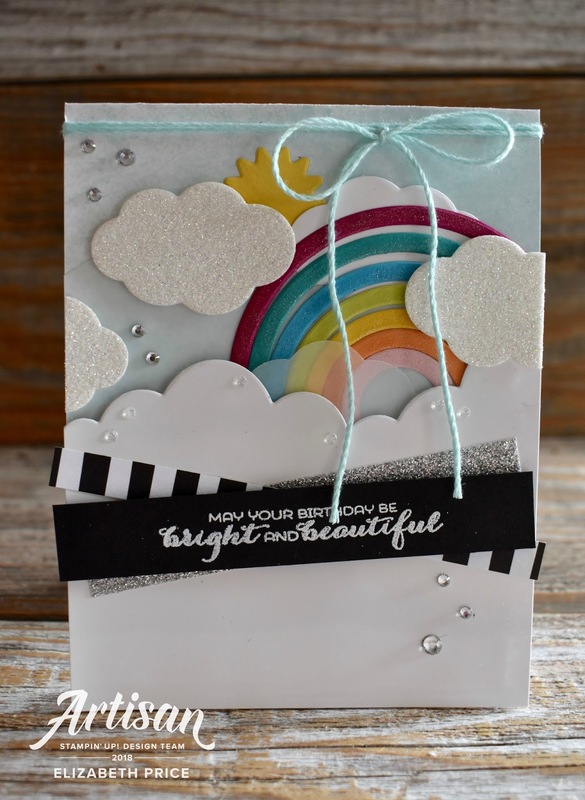 There are Dazzling Diamonds Glimmer Paper clouds and a strip of Silver Glimmer Paper, along with a scattering of Basic Rhinestones and Glitter & Clear Epoxy Shapes. 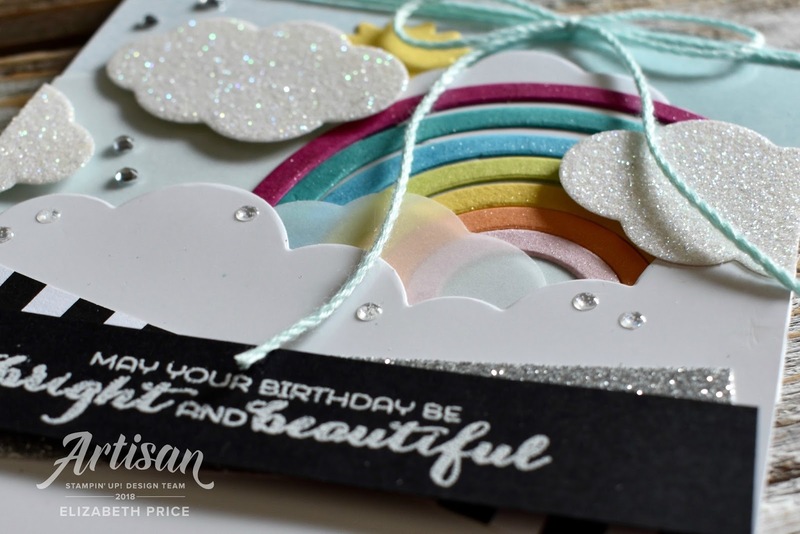 A closer look at the rainbow and you may notice some more shimmer. I brushed all the colors of the rainbow with Wink of Stella. I like the black and white strip of Tutti Frutti DSP as it mimics the rainbow stripes. And last, I love twine. Any color, I love all kinds of twine. So, it seemed fitting to tie a Pool Party Solid Bakers Twine shoestring tie around my card. 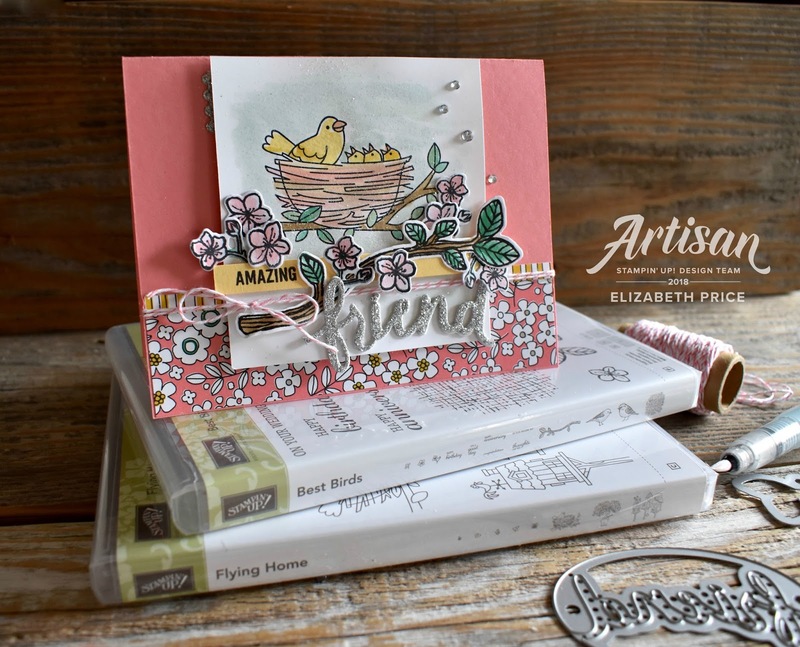 Two totally awesome bird themed stamp sets is what I used to create my card for this sketch challenge over at Hand Stamped Sentiments #286. I grabbed the Best Birds and Flying Home to put together a sweet friendship cards. I have such fabulous friends and I am super grateful and blessed that they are a part of my life. My card base is Flirty Flamingo, and In Color which will retire at the end of May. I have grown to adore this color and will miss it for sure. Two strips of Patterns and Pieces DSP are my new layers and they helped guide the rest of my color choices. 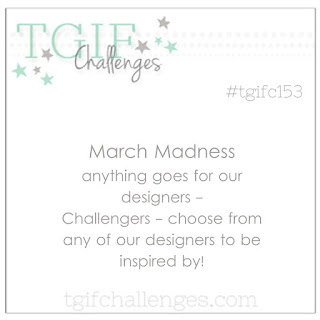 My paint colors include Flirty Flamingo, Crushed Curry, Emerald Envy, Soft Suede and a little Pool Party. I love that Best Birds has a matching Thinlit set. 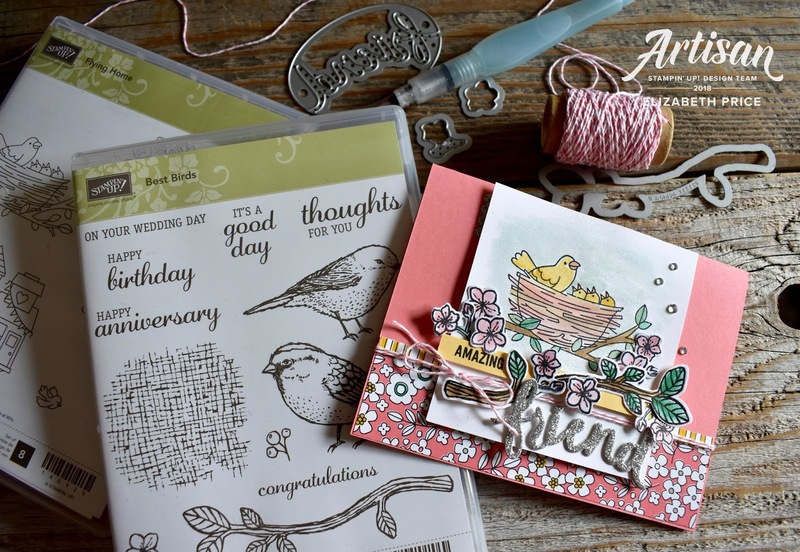 I cut the branch and blossoms with pieces from the Birds and Blooms Thinlits to decorate my stamped image and finish the sketch. For the greeting "amazing" I used the Thoughtful Banners. I stamped it on a strip of So Saffron with Basic Black ink. The "friend" comes from the Lovely Words Thinlits. 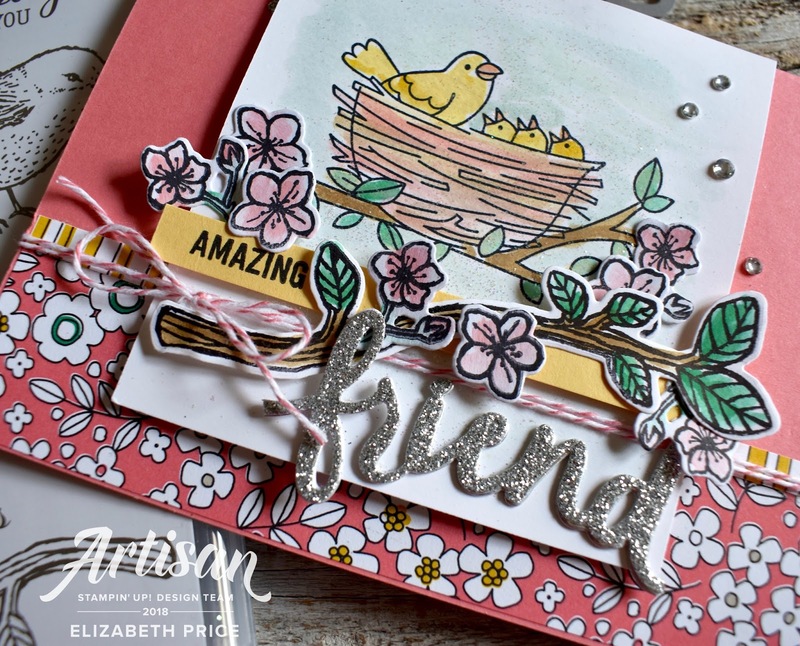 I stacked three of the "friend" cut outs with the top layer being Silver Glimmer Paper. I stack them in place of using dimensionals. 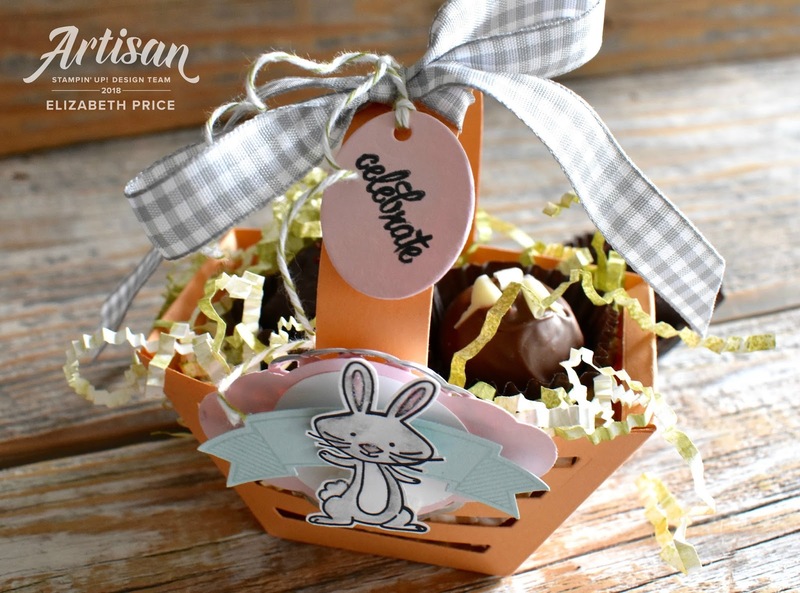 I have the cutest Peach Parfait mini Easter baskets to share for our Monday Montage Blog Hop. With one piece of the Window Box Framelits, one quick straight cut, and one strip of cardstock I made this little cutie pie. I have decorated the basket with the We Must Celebrate and Thoughtful Banners Stamp Sets and some punched layers of pastel toned papers. Filling the basket is dyed white Ready Shreddie. That's right I dyed the crinkled packing papers. All I did was to spritz the white crinkle paper with a Mini Mister filled with rubbing alcohol and about 20 drops of Pear Pizzazz Ink Refill. You could use water, but I like how fast the color dries when using rubbing alcohol. Cut one piece of the Window Box Framelits. Fold on all the tabs. This will help you see where to cut for step 3. Cut the hexagon shape in half using the folded tabs to help you see where to cut. See photo below for guide. 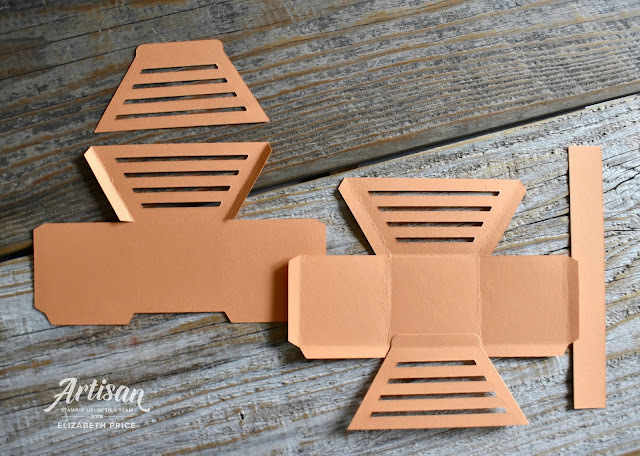 Using the open line piece from the Window Box Framelits two times, once for each half of the hexagon shape. See photo below. Adhere the cut half of the hexagon to the opposite side of the three panel section. See photo. Fold box inward and upward to form basket, glue on all tabs. Cut a 3/4" x 4 1/4" strip for a handle and glue in place. 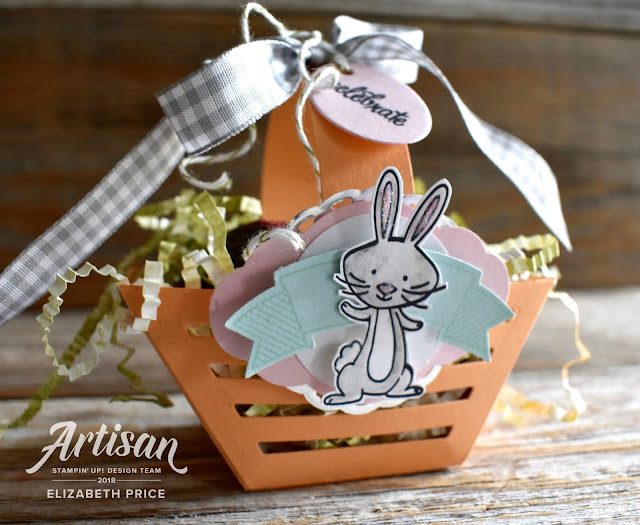 What Easter basket would be complete without a bow? I just had to add a big loopy gingham bow and tag to finish it all up and make it perfect for giving to a friend. 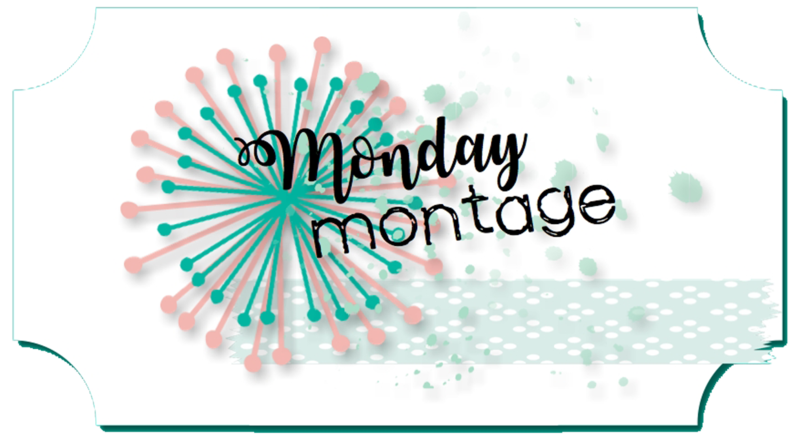 Thanks for stopping by and visiting me along the Monday Montage Hop. 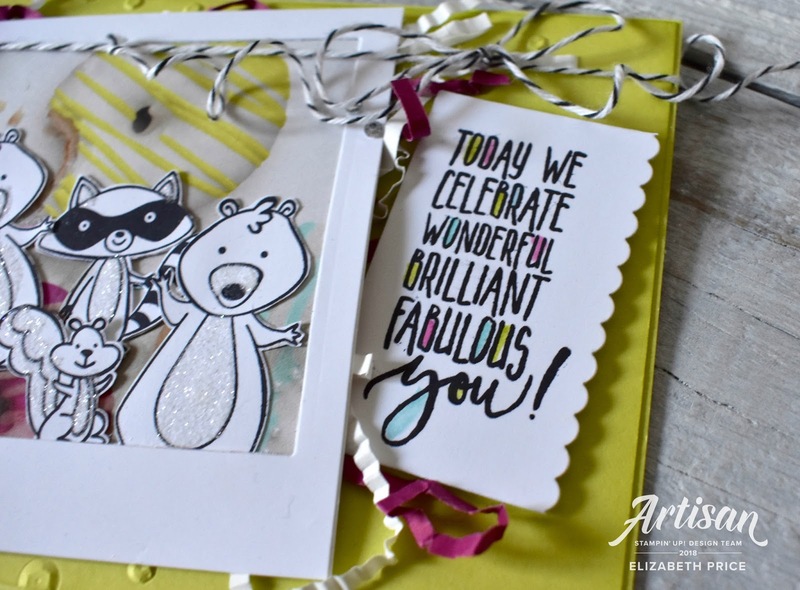 You are next going to pop over to Julie Warnick's blog where she has something cute and clever to share. 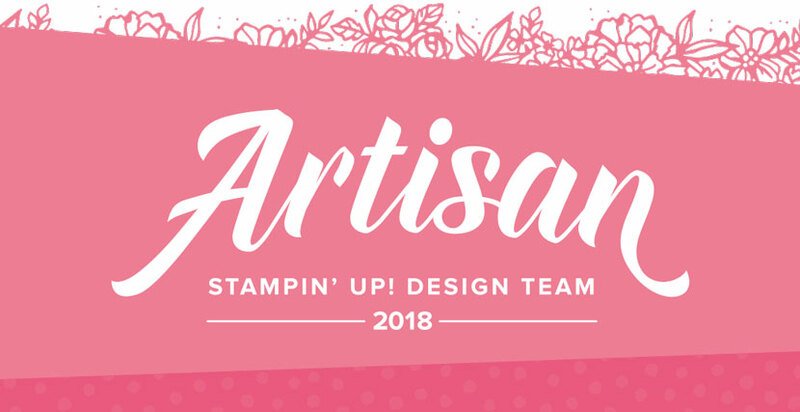 My cards are being featured on Stampin' Up! 's Corporate Blog!! There, I am sharing a trio of "faux Polaroid picture perfect" cards. 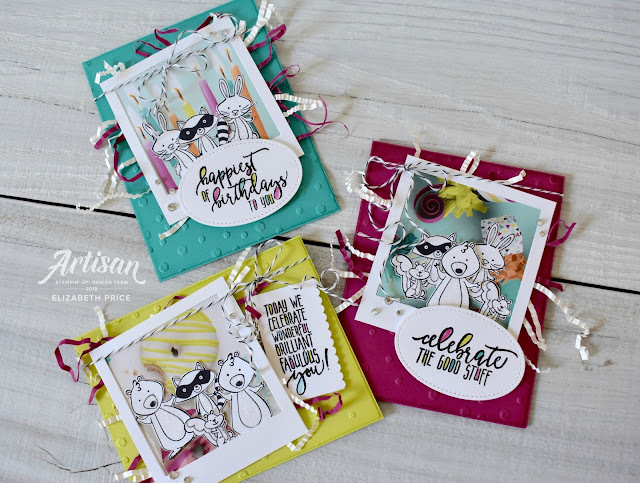 These cheerful greeting cards feature Picture Perfect Party 6” x 6” Designer Series Paper (item 145559) faux Polaroid pictures which have been photo bombed by a bunch of adorable critters from the We Must Celebrate Stamp Set (item 145898). 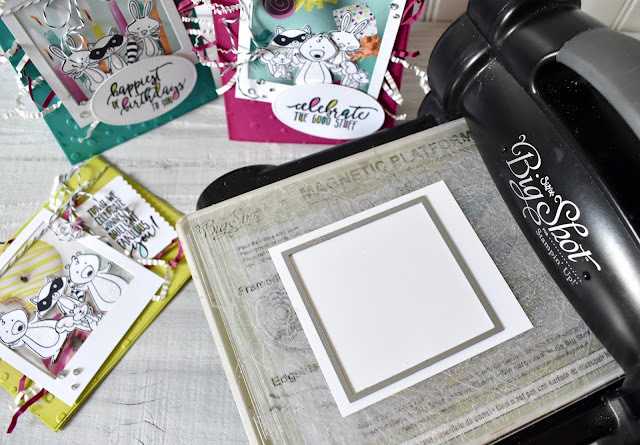 To make easy Polaroid frames I cut pieces of Whisper White Card Stock (item 100730) 3 3/8” wide by 3 3/4” tall. Next, I used the Layering Square Framelits (item 141708) to cut the frame. Align the framelit as shown in the photo below. The base of the Lemon Lime Twist Cardstock (item 144245), Bermuda Bay Cardstock (item 131197), and Berry Burst Cardstock (item 144243) cards have been embossed with the Scattered Sequins Dynamic Textured Impressions Embossing Folder (item 145649). Each of the framed Polaroid pictures is backed with pieces of the Sweet Soiree Ready Shreddie (item 145562). To adhere the crinkled paper shreds I added three strips of Tear & Tape (item 138995) on the back side. I pressed the shreds into the tape and then clipped the really crazy extra long pieces away. The greetings are stamped using the Picture Perfect Birthday Stamp Set (item 145519) and Basic Black Archival Stampin’ Ink (item 140931). 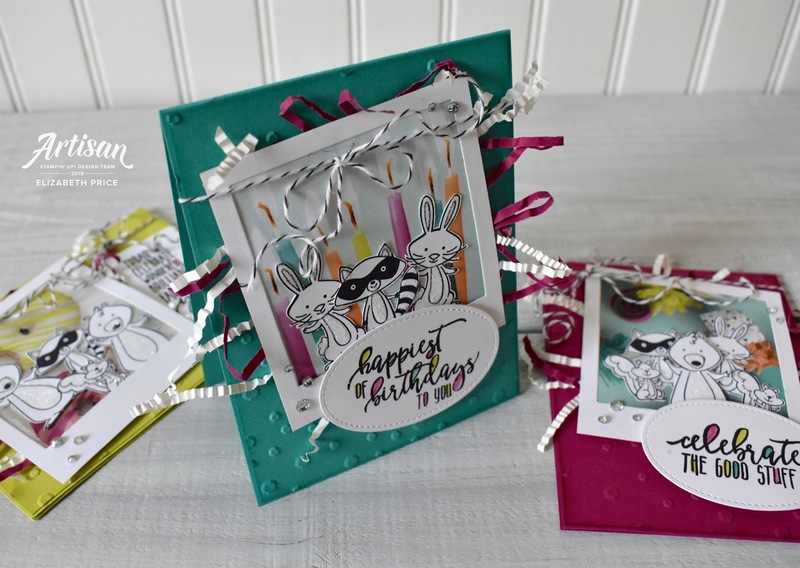 I swooshed ink in the greetings with an Aqua Painter (item 103954) and Lemon Lime Twist Classic Stampin’ Pad (item 144086), Berry Burst Classic Stampin’ Pad (item 144083), and Bermuda Bay Classic Stampin’ Pad (item 131171). 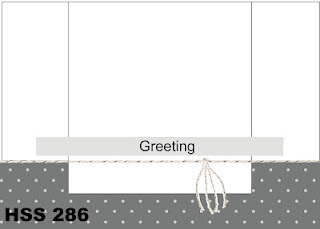 I cut two of the greetings using the Stitched Shapes Framelits (item 145372). 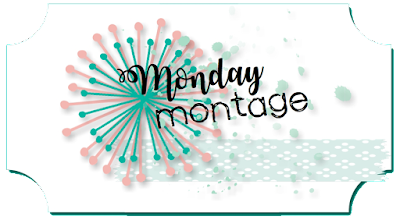 To cut a shape perfectly sized to fit the third greeting image I ran it through the Big Shot (item 143263) twice to make two cuts using the Layering Square Framelits (item 141708). Once with one of the square shapes and then a second time with a scalloped square to create a fun edge. 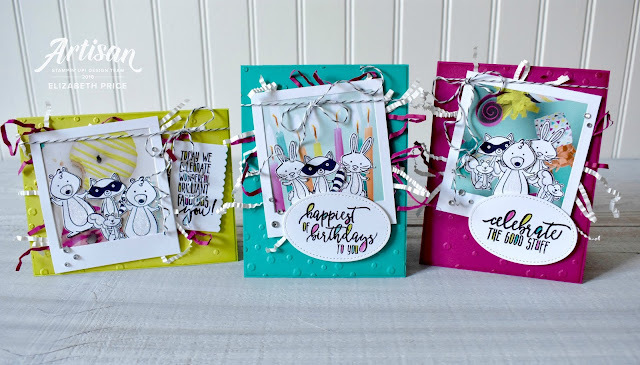 All three cards are embellished with a few of my favorite accessories: Basic Black Bakers Twine (item 134576), Rhinestones Basic Jewels (item 144220), and Dazzling Diamonds Stampin’ Glitter (item 133751). It has been a blast sharing these Polaroid style celebration themed cards with each of you!